Tasting notes on extraordinary cult-favorite small batch coffees. Every Thursday, I show y'all one of the gorgeous quilts that my grandmother has made for me over the years. Today, it seemed seasonally appropriate to show you this Jack O'Lantern themed quilt she made me a couple of years ago. How fun are the sad and surprised pumpkins? Tutorial for a Kentucky-themed t-shirt rag quilt. I've shown you most of my quilt collection before, but this may just be the most special one of all! Several years ago, we were able to find some yardage of this gorgeous Lilly Pulitzer print on eBay. The print is "Low Riders," and it features gorgeous shades of mint, periwinkle, and butter, as well as horses and some rather iconic spires. Of course, it's no secret that Lilly and Derby go hand in hand! My local Lilly Pulitzer store, The Peppermint Palm, goes all out for Derby; they always work with local milliners to match the latest Lilly prints, host the Derby Festival Princesses, and generally have lots of Derby-time fun! The ties between the Lilly Pulitzer brand and the equestrian lifestyle go back to Mrs Pulitzer's own love of horses. The late Mrs Pulitzer often cited these ties to her own childhood memories of traveling to Kentucky from her family's upstate New York home to watch her stepfather's horses run at Churchill Downs. As a young adult, Lilly even served as a horseback courier for the Frontier Nursing Service in southeastern Kentucky! My Lilly Derby quilt is such a special keepsake, because it combines so many things that I absolutely love -- Lilly Pulitzer, the Kentucky Derby, and the priceless feeling of having a quilt made by my grandmother! There is one event the entire year revolves around. There is one event every Kentuckian around me loves but also dreads. The tourists. The crowds. The traffic. Nope! That's for you central Kentuckians. Over here in Western Kentucky, the event of the year is the AQS Quilt Show. Starting early this week, the streets of Paducah will start to fill with quilters from near as far (seriously, FAR, as in Japan far) and really live up to its name The Quilting Capital OF. THE. WORLD. 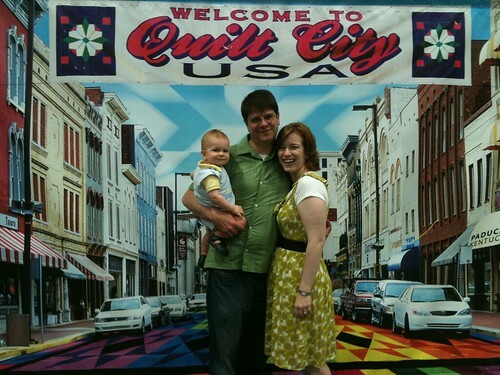 The Quilt Show transforms the entire town. I will never forget the first year I moved back. I walked into my favorite coffee shop downtown only to find the front had been filled with fabric bolts of every color. Coffee shop/Fabric store! Only during the Quilt Show. Some less enthusiastic citizens complain about The Quilt Show. These are the people who have never actually gone to the Convention Center and taken in the beauty and artistry that is competitive quilting. These are the people who prefer to frown over the slightest change in their routine and giggle at the ladies in their quilted vests. These are the people who don't even go down town the entire week for fear of being confronted by someone not from Paducah! These are not my people. I'm very lucky to have my own quilting tour guides every year. My husband's parents run Planet Patchwork, a popular quilting website, and have been coming to the Show for years. (That's how I knew Nicholas and I were meant to be. He took me to the Quilt Museum on his first visit to Paducah and showed me his father's endorsements in the front of all the quilting books.) They show me all the best shops and shows. We eat at the church quilting luncheons. It's a blast to be a foreigner in your own town. So, as the rest of Kentucky gears up for a little horse race, Paducah will be living large with the quilters. If you're not from around here, I encourage you to come by. And if you are from Paducah and have never embraced the Quilt Show in all its glory, it truly is your loss. Julia Child said that "People who love to eat are always the best people." Let me tell you, this Thanksgiving, Julia would certainly approve of everyone at my house. We've feasted and given thanks, and we decorated the sofa with this gorgeous cooking-themed quilt that my grandmother made for me a few years ago. I love the fun prints and colors in this one!